The Morans founded their studio "Objects" in 1988. 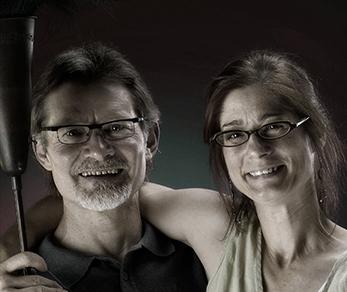 Both Robert and Andi are graduates of Louisiana Tech where both have taught art and design. Andi has also studied ceramics at Penland, Arrowmont, and the Archie Bray foundation. Since 1996 Andi has worked as a full-time studio artist. Until 2010 Robert split his time between the studio and the classroom; now retired as Professor Emeritus, he works with Andi full-time in the studio. The Morans have exhibited in over 80 juried and invitational shows throughout the country, including the Smithsonian Craft Show. They have participated in numerous juried, national trade shows and have been represented by galleries in virtually every major metropolitan area of the U.S. Their work has been featured in The Washington Post, in Smithsonian magazine, American Craft and in numerous other regional and national publications. Among the awards which the Morans' work has won are two NEA/Louisiana Division of the Arts artist fellowships, "Best Lamp" award in the national competition "Table, Lamp + Chair", and a Roger Ward Ranger Fund Prize at the National Academy of Design. The Morans work with a vocabulary of forms and a palette of finishes which are intended to evoke the archaic and primordial. Most of the work is low-fired, white earthenware; but numerous pieces, especially one-of-a-kinds, include steel, resin, fabric, and other media in the realization of particular design ideas. To give the illusion of a time-wrought patina, ceramic finishes involve a sequence of applied layers of slip, stain, and glaze, followed by surface abrasion; metal finishes typically involve the application of acids to achieve oxidation and rusting. The Morans' sculptures, lamps, boxes, vessels, and furniture derive from their personal interests in tribal, biological, psychological, botanical, mechanical and architectural references.